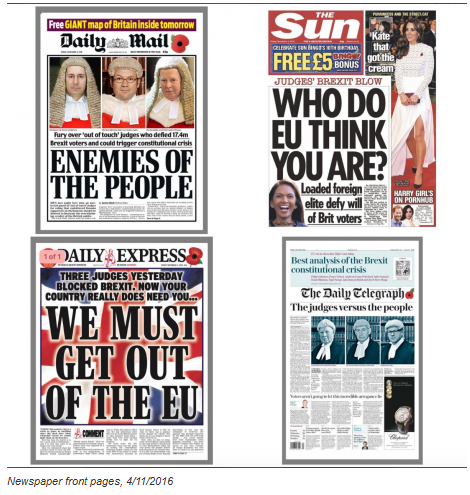 Anthony Barnet writes at Open Democracy, an article called, “The Media Monarchy”, in which he looks at the Law, the Media, contempt and the bullying of the Supreme Court. He finishes by pointing out that our Constitution is the result of centuries of fighting against originally despotic monarchs amd that the new unaccountable, unchallengeable power potentially oppressing citizens is the media and while he doesn’t make much of it, the UK, has the weakest foreign ownership controls on the media. “Their decision reinforced Brexit’s toxic consequences for the constitution. Barnett is the only correspondent who explores the importance of the perceived irrevocable nature of the Article 50 notice which it seems is now common ground between the Government and the litigation principals. He also raises the issue of the bullying of the Supreme Court through the monstering of the Judges. The press and Farage with his proposed demo outside the Court should probably be charged with contempt. Richard Burgeon, the Shadow Spokesman on Justice, and unlike his Government opposite number, Liz Truss, a qualified Lawyer calls out her disgraceful behaviour in not supporting the judges and the independence of the judiciary. The common agreement that Article 50 notice being irrevocable is a problem for some, at least for me. Firstly, it is an issue on which the EU’s Court has the last word where as determining the British Constitution is a matter for the British Courts alone. However also, now the parties agree, the Supreme Court may not re-consider the question of the irrevocable nature of the Article 50 notice. Its a tragic weakness of the adversarial court system that Courts only consider the interests of the participants, and not the public interest. Let’s hope that the friends of the Court ensure that the public interest is represented. I am looking to write something about the roles of referenda in political theory, Barnett and his link to Wier’s article are probably important sources.